15 minutes, remove the paper and baking beans and bake for a further 4-5 minutes. Remove from the oven and set aside to cool slightly. 2. Meanwhile, place the lemon zest and juice in a large bowl. Peel, core and thinly slice the apples and add to the bowl, turning them through the lemon juice to prevent them from turning brown. Drain and discard any liquid that collects at the bottom of the bowl. Sprinkle the sugar and flour over the top of the apples and gently toss to distribute evenly. 3. Layer half the apple slices into the baked pastry case. Scatter over the blackberries then top with the remaining apple slices. 4. To make the topping, place the flour in a bowl with the butter. Rub in the butter using the tips of your fingers until it resembles coarse breadcrumbs. Coarsely chop the toasted nuts and stir into the mixture with the oats and sugar. Sprinkle over the top of the apples, then bake for 45-50 minutes until golden and the apples are tender. 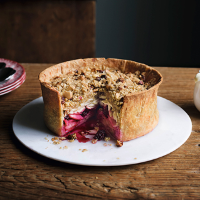 Serve warm with the blackberry and apple juices from the pie, and cream or custard. This recipe was first published in Wed Jul 31 14:19:00 BST 2013.